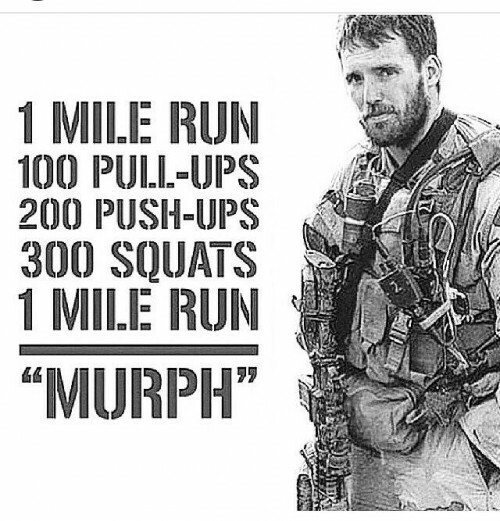 Murph” is a CrossFit Hero WOD named after Navy Lieutenant Michael Murphy, who was killed in Afghanistan June 28th, 2005. He was 29, of Patchogue, N.Y. Lt Murphy was awarded the Congressional Medal of Honor after his death. The workout was one of Mike’s favorites and he’d named it ‘Body Armor.’ It first appeared on the CrossFit site 18 August 2005. Engaged in a frenzied firefight and outnumbered by the Taliban, Navy Lt. Michael Murphy made a desperate decision as he and three fellow SEALs fought for their lives on a rocky mountainside in Afghanistan’s Kunar Province in 2005. Then he continued the battle. Dan Murphy, the sailor’s father, said it didn’t surprise him that his slain son nicknamed “The Protector” put himself in harm’s way. Nor was he surprised that in the heat of combat his son was courteous. “That was Michael. He was cool under fire. He had the ability to process information, even under the most difficult of circumstances. That’s what made him such a good SEAL officer,” Murphy said. A warship bearing the name of the Medal of Honor recipient was christened at Bath Iron Works, where the destroyer is being built. Murphy, who was 29 when he died, graduated from Pennsylvania State University and was accepted to multiple law schools, but decided he could do more for his country as one of the Navy’s elite SEALS — special forces trained to fight on sea, air and land — the same forces that killed Osama bin Laden this week in Pakistan. Murphy, of Patchogue, N.Y., earned his nickname after getting suspended in elementary school for fighting with bullies who tried to stuff a special-needs child into a locker and for intervening when some youths were picking on a homeless man, said Dan Murphy, a lawyer, former prosecutor and Army veteran who served in Vietnam. Maureen Murphy said he thought he was too young to take a desk job as a lawyer. Instead, he went to officer candidate school, the first step on his journey to become a SEAL officer. He was in training during the Sept. 11 attacks, which shaped his views. His view was that there are “bullies in the world and people who’re oppressed in the world. And he said, ‘Sometimes they have to be taken care of,’” she said. On June 28, 2005, the day he was killed, Murphy was leading a SEAL team in northeastern Afghanistan looking for the commander of a group of insurgents known as the Mountain Tigers. The Operation Red Wings reconnaissance team rappelled down from a helicopter at night and climbed through rain to a spot 10,000 feet high overlooking a village to keep a lookout. But the mission was compromised the following morning when three local goat herders happened upon their hiding spot. High in the Hindu Kush mountains, Murphy and Petty Officers Marcus Luttrell of Huntsville, Texas; Matthew Axelson of Cupertino, Calif.; and Danny Dietz of Littleton, Colo.; held a tense discussion of the rules of engagement and the fate of the three goat herders, who were being held at gunpoint. If they were Taliban sympathizers, then letting the herders go would allow them to alert the Taliban forces lurking in the area; killing them might ensure the team’s safety, but there were issues of possible military charges and a media backlash, according to Luttrell, the lone survivor. Murphy, who favored letting the goat herders go, guided a discussion of military, political, safety and moral implications. A majority agreed with him. An hour after the herders were released, more than 100 Taliban armed with AK-47 assault rifles and rocket-propelled grenades opened fire, attacking from higher elevation, and maneuvering to outflank the SEALs, said Gary Williams, author of “Seal of Honor,” a biography of Murphy. Dan Murphy said his son made the right call. “It was exactly the right decision and what Michael had to do. I’m looking at it from Michael’s perspective, that these were clearly civilians. One of them was 14 years old, which was about the age of his brother. Michael knew the rules of engagement and the risks associated with it,” the father said. As the only survivor, Luttrell has pangs of regret for voting to go along with Murphy, his best friend; he now believes the team could’ve survived if the goat herders were killed. In his own book, “Lone Survivor,” Luttrell wrote that Murphy was shot in the stomach early in the firefight, but ignored the wound and continued to lead the team, which killed dozens of Taliban attackers. The injuries continued to mount as the SEALs were forced to scramble, slide and tumble down the mountain in the face of the onslaught. By the end of the two-hour firefight, Murphy, Dietz and Axelson were dead. The tragedy was compounded when 16 rescuers — eight additional SEALs and eight members of the Army’s elite “Night Stalkers” — were killed when their MH-47 Chinook helicopter was shot down by a rocket-propelled grenade. It was the largest single-day loss in naval special warfare history.